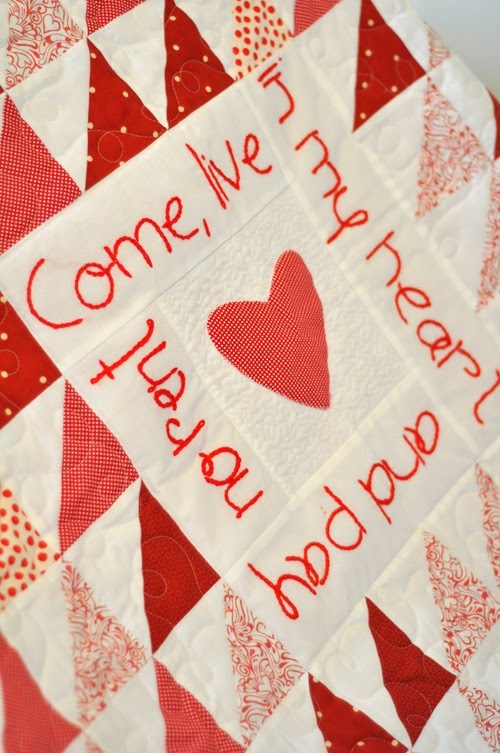 Our Very Own Red & White Charity Quilt Show! This is Joanna Figueroa from Fig Tree here today and I wanted to share about something that I am so proud to be a part of. It all started over a year ago during one of our Fig Tree late night classes… we were pouring over photos from the amazing red and white quilt show in Manhattan at the Park Avenue Armory in March, 2011. 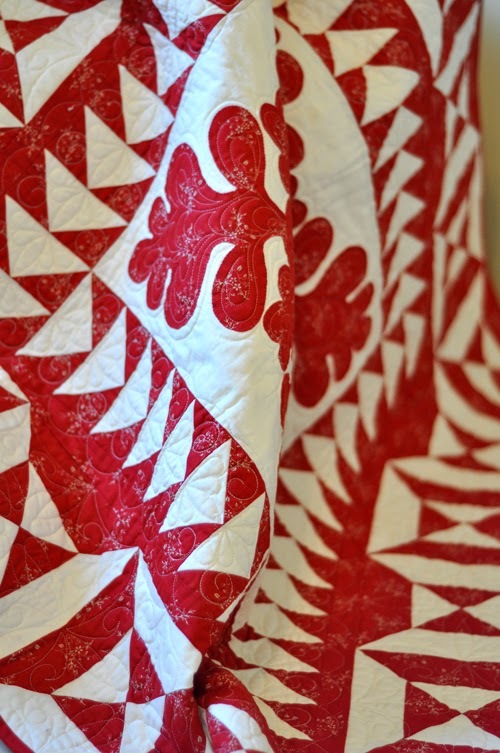 Curated by the American Folk Art Museum, this exhibition displayed 651 red and white quilts from the collection of Joanna S. Rose and was an inspiration to all- quilters and non quilters alike- who had the good fortune to attend. If you have never had a chance to see photos, click HERE, HERE or HERE for some! And for us a little idea was born. 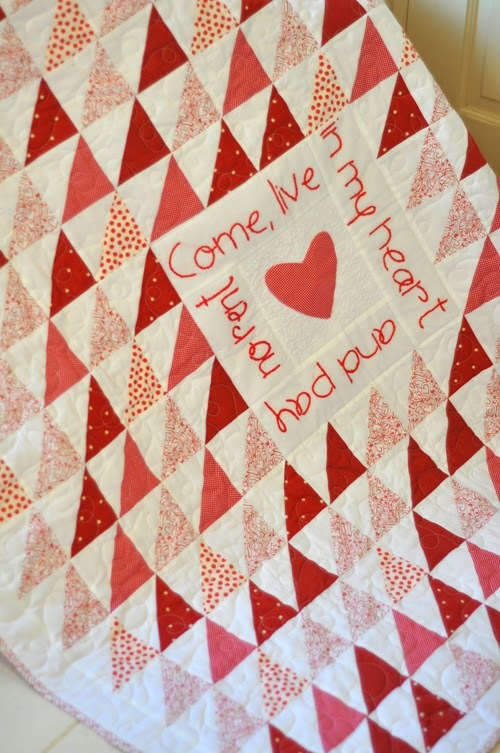 That night we decided to create our own humble local version of that classic red and white quilt show and donate all the proceeds to a local charity near and dear to our hearts, The George Mark Children’s House in my home town of San Leandro. Since then many friends have joined us including several generous MODA designers and MODA itself to help create quilts and offer donations of time, raffle prizes and money. We are so very grateful for all your support. This first one is a quilt that I am finishing up as we speak. 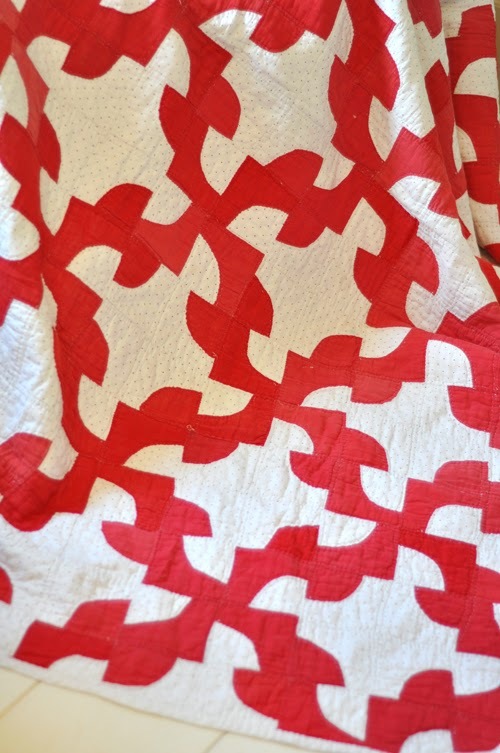 One of our vintage Fig Tree patterns called A Yuletide Snowflake. No matter how many times I make this one, I never get tired of it! 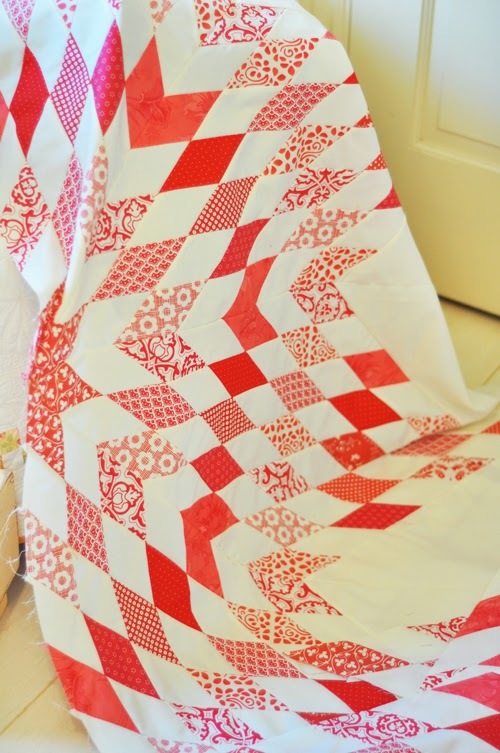 One of the lovely donations by MODA friends, this lovely lap quilt from Polly and Laurie of Minick and Simpson has both piecing and applique in it and used the gorgeous Minick & Simpson fabrics. 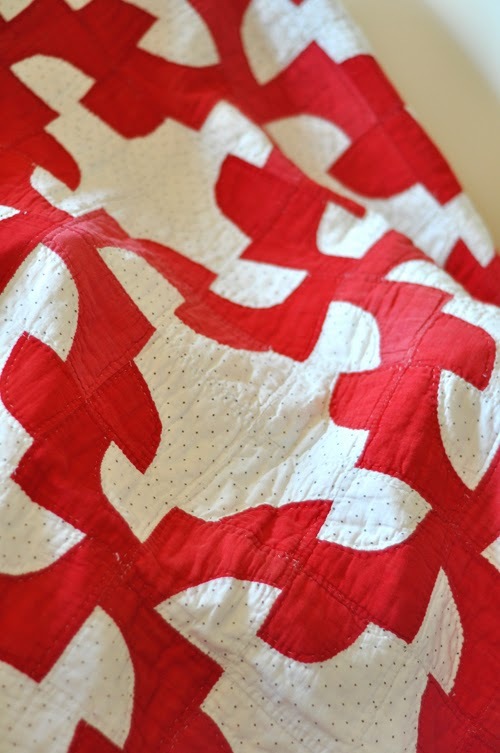 My dear friend Kaari of French General sent a lovely vintage quilt- a red and white Drunkard’s Path pattern, this quilt has tiny little black dots on the cream background, a solid turkey red fabric and is hand quilted. I will definitely be bidding on this one! There are more on their way as we speak and several more here that I haven’t had a chance to photo yet, that I hope to share with you next week. For all those of you who are local or close enough for a road trip, please attend. 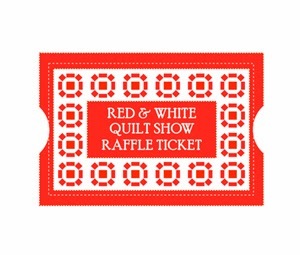 We would love to see you, to meet you and to have you see our lovely red and white quilts, both new and vintage! Hopefully you might feel inspired to bid on some of them! If you are local in any way, please purchase a ticket, email me for more info on admissions tickets. Advance purchase of the ticket enters you into a drawing for a $100 Whole Foods Gift Certificate and other door prizes as well as entrance to the show, appetizers and white wine. Tickets are also available at the door but will not be eligible for the Whole Food Gift Certificate. There will also be other raffle prizes available at the show as well as door prizes! For those of you a bit further away, you could still participate by purchasing RAFFLE TICKETS! 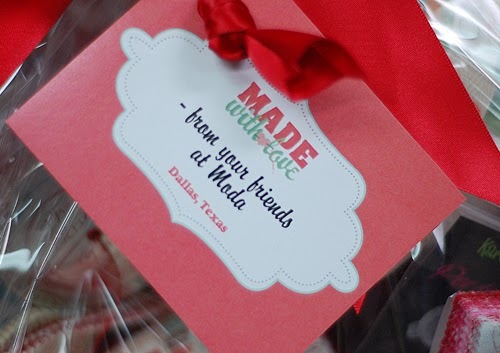 We have those available in our Fig Tree shop on the website and we will add your name and phone number to each and every ticket you purchase and put it into either the raffle for the Cherry Pie Quilt or the MODA GIFT BASKET OF LOVE! If you have a preference as to which raffle you would prefer, please let us know when you purchase the tickets. Otherwise, we will add your tickets into whichever one has less tickets! 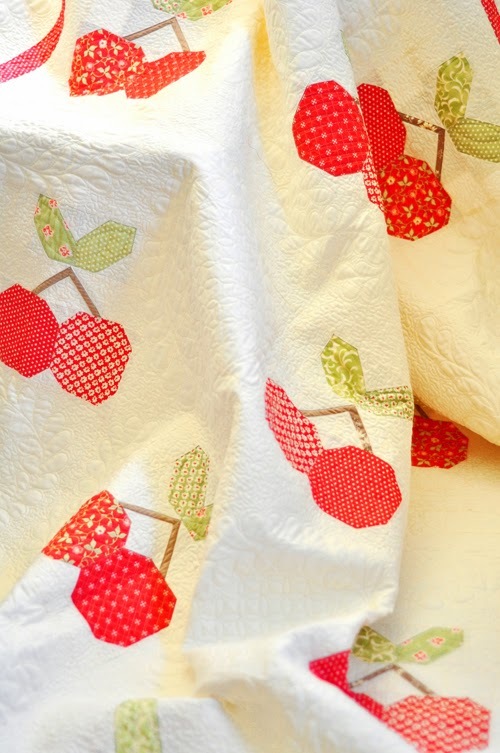 The Cherry Pie Quilt was made by a dear customer and donated to our cause! It is made from one of our fabulous Fig Tree kits and so the fabrics are Fig Tree as seen above. The quilt has also been professionally quilted! Our customer prefers to remain anonymous but we just want to thank her again for her generosity and willingess to help! The MODA GIFT BASKET OF LOVE is another amazing and generous donation from the fabulous ladies and Mr. Dunn at MODA fabrics. 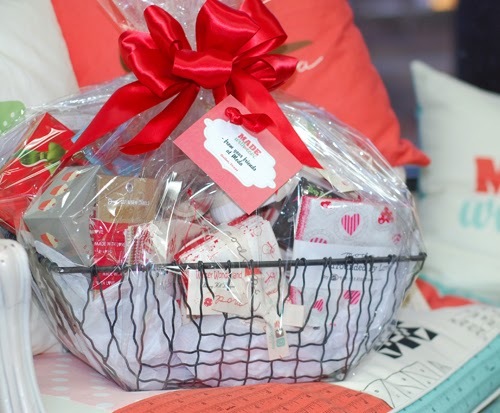 The basket is chalk full of fabrics and notions and goodies in the red and white theme. 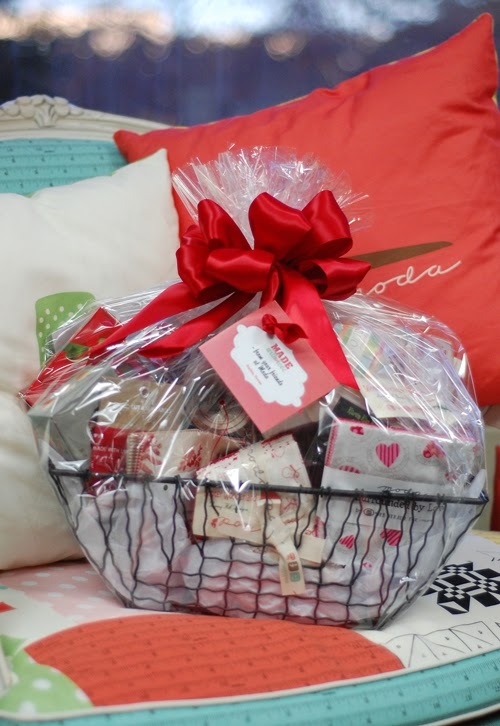 Valued at $250, this is a basket that any quilter would love to win! Click HERE FOR RAFFLE TICKETS and to see what we’re up to. Fig Tree will send you some patterns as our way of saying thank you for your donation so be sure to include your mailing address. We will take donations all the way to the day before the event on February 8. We will then combine those donations with all the others we hope to receive through the quilt auction and the tickets and present them all to the folks at George Mark at the same time. Thank you so much for asking and to those of you who have already sent checks! If you have any questions at all, please don’t hesitate to ask. 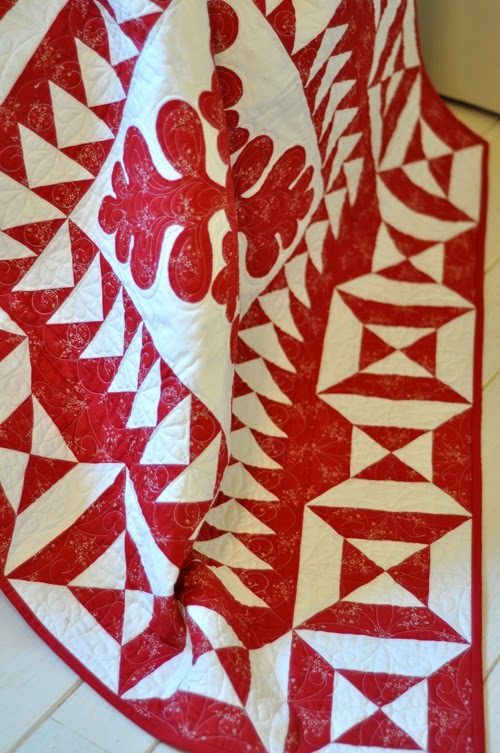 We will be showing you more quilts soon. 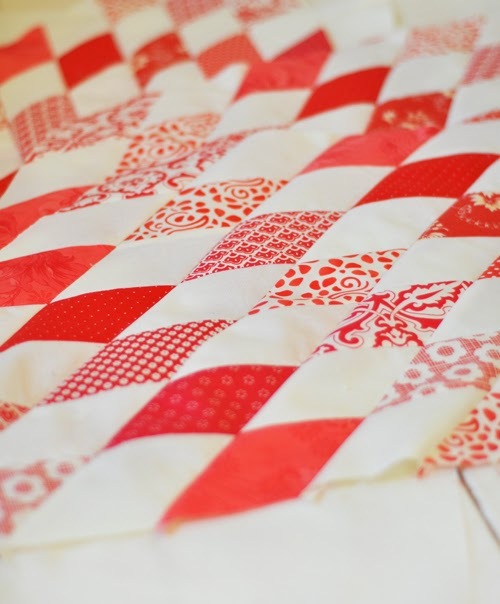 By Guest BloggerIn Fabrics2 Comments on Our Very Own Red & White Charity Quilt Show! What an ingenious way(s) to raise money for your worthy cause! It’s amazing how things like this can grow when put together by such committed ladies like you. I applaud you. 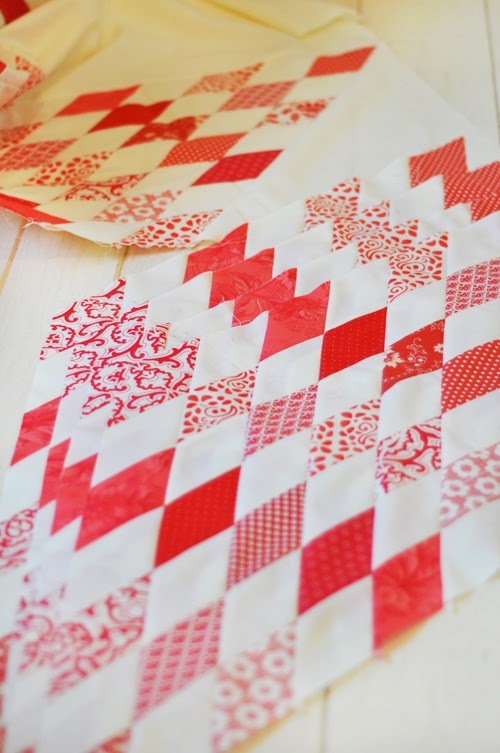 I love red, and the snowflake quilt is my favorite. Absolutely beautiful! !